The BEST Crinkle Top Brownies. 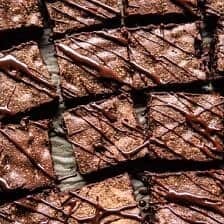 crinkle top brownies from Half Baked Harvest on Vimeo. Because there is a lot to celebrate today, and because it’s FRIDAY…and everyone knows that Friday’s deserve chocolate. 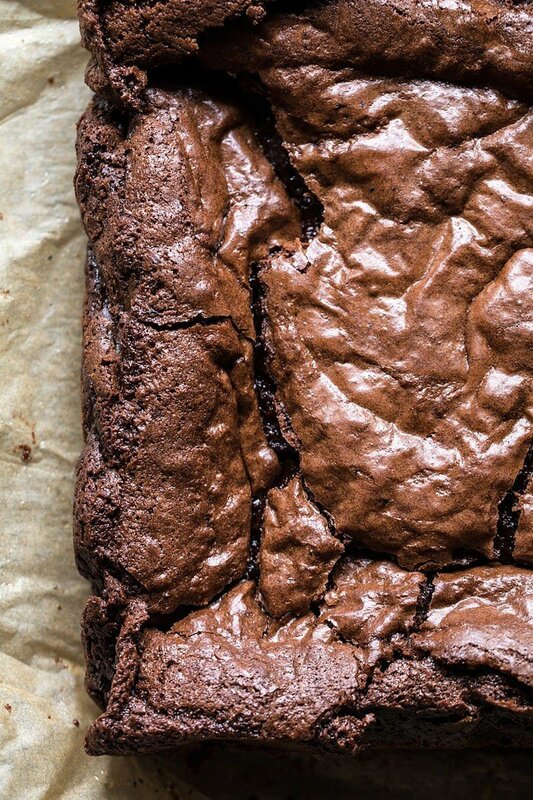 So if there was ever a classic brownie recipe to have in your back pocket, it’s this one. Trust me on this. They remind me of the brownies I’d eat as a kid, and I’m really not sure there’s anything better. These are light, a little fudgy, extra chocolatey, perfectly sweet, and they have the most flakey, crinkly top ever. Oh my gosh, SO GOOD. Before I dive into the delicious details, let me explain the reason I am sharing them. As most of you know by now, my younger brother Red took home his first Olympic gold medal last week in Men’s Snowboard Slopestyle in PyeongChang, South Korea. If you missed my recap post, you can read part one here and part two here. I said from the start that I wasn’t going to make any fancy Olympic themed food. One, because I am not good with decorating food in fancy ways, and two, because I just didn’t have any great ideas. That said, after returning home from Korea last week, I felt the need to create a recipe that I knew Red would love. I mean, he did win GOLD, so a celebratory dessert is certainly in order. Right? Yes, yes, yes. For sure. Here’s the thing, Red’s a semi picky eater, and doesn’t like anything fancy. His favorite desserts are Special K-Bars (cookbook recipe), chocolate chip cookies, and brownies. I have a lot of brownie recipes on HBH, but I don’t have one brownie recipe Red would actually eat. Red likes his brownies simple. Chocolate, no frosting, maybe some powdered sugar, and preferably eaten slightly warm. So basically the brownies my mom would make us when we were kids. The ones that came straight out of the Betty Crocker box. 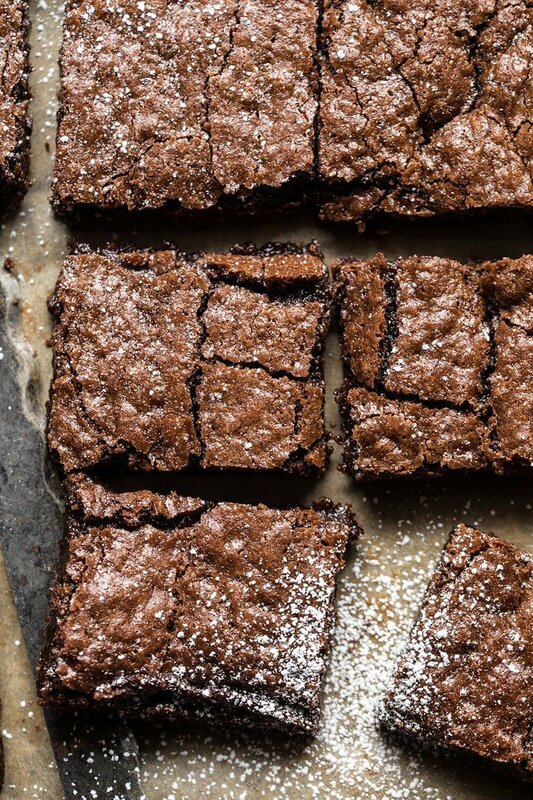 Not going to lie, I loved them too…which is why I am SO excited about these brownies. I really cannot stress enough just how good they are. When I set out to make these brownies, I thought for sure that I’d make them first try and they’d be perfect. I think I felt so confident because I’ve made a hundred and one brownie recipes. But guys, I tested these brownies over and over and over. It was so important to me that they would have the perfect texture, not be dense or cakey, and have the most flakey, crinkly top. They needed to be perfect, just like the ones I remember eating as a kid with my brothers. It took a while, used up a lot of eggs…and even more butter. Like two full days of testing, way over a dozen eggs, probably pounds of butter. Six batches later (possibly more, I lost count), I finally got them right. My freezer is now full of brownies. It’s awesome and very dangerous. So what’s the secret to that perfect texture and crinkly top? The chocolate is obvious, but the whisked eggs? You need those to create that crinkly top. Whisking the eggs prior to mixing them in the batter creates air within the eggs that helps to create that crinkly top. It might seem like an unnecessary step, and a waste of a clean bowl, but just trust me on this, it’s what makes these brownies great. While that and all the semi-sweet chocolate…and butter. Red has yet to try these brownies, seeing as he’s still in South Korea, but I’m feeling pretty confident that he’s going to love them. Speaking of Red, he is competing one last time tonight in Men’s Snowboard Big Air, alongside two of his USA teammates, Kyle Mack and Chris Corning. Kyle is a super close friend of the family, who’s honestly almost like another brother. Pretty excited for the both of them, but I have my fingers crossed for Kyle on this one, as Big Air is much more his event. Make sure to watch tonight at 8pm EST on NBC! Annnddddd with that, I’m thinking these brownies are the perfect chocolate treat to eat while cheering the boys on. These brownies are light, a little fudgy, extra chocolatey, perfectly sweet, with the most flakey, crinkly top ever. Oh my gosh, SO GOOD! 1. Preheat the oven to 350 degrees F. Line a 9x13 inch pan with parchment paper. 2. In the microwave, melt together the butter and 1 1/2 cups chocolate chips (stir at 30 second intervals) until melted and smooth. Stir in the sugar, vanilla, and instant coffee. 3. In a small bowl whisk the eggs for 1 minute until bubbly on top. Stir the eggs into the chocolate mix. Add the flour, cocoa powder, and baking powder. Stir until just combined. Stir in the remaining 1/2 cup chocolate chips. 3. Evenly spread the mixture into the prepared baking pan. Bake for 28-30 minutes or until the brownies are just set. Let cool (or not) and dust with powdered sugar. Enjoy! 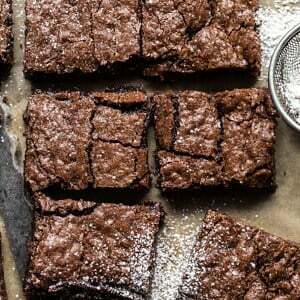 *For extra thick brownies, bake them in a 9x9 inch square baking dish and bake for 30-35 minutes. Hi Lynn! It is 226 grams! I hope you love these brownies! They look so good! I can actually feel them sticking to my teeth as I bite, know what I mean? Just looking at the photos makes me feel that! Totally know what you mean and so glad you are loving these! Thank you Ruth! So glad you like this! Thank you Shawnna! brownies are so yummie so yes, I will try them! Trying this weekend….with Gold Medal flour. Ha! When Red won, I thought you might make him pizza with French fries. These brownies look perfect for dessert (or in my case, an appetizer). Congrats to Red and your family! Haha so perfect! Thank you so much Kelly! I hope you love these! They look delicious. I always like the crunchy part of the brownies. Do let us know how Red likes them! Thank you so much Rachel! That is a great idea! Making these today. Too much snow out, not to! Yummy. Good luck to the boys tonight. 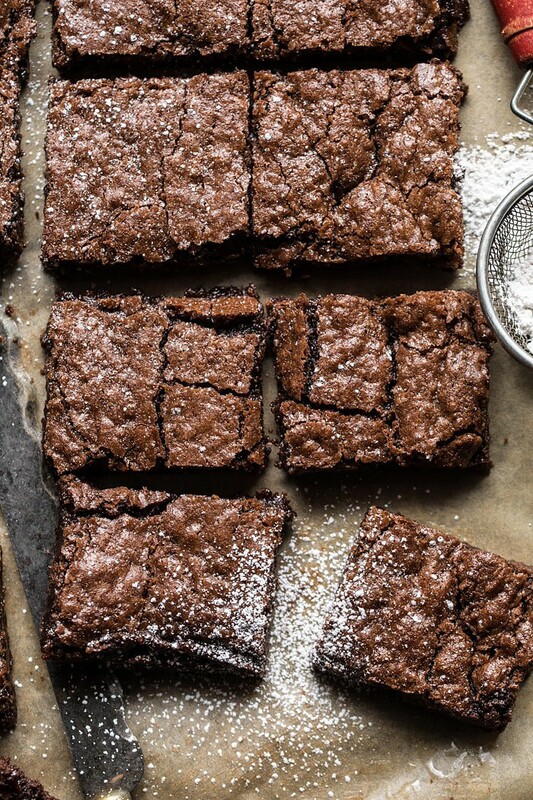 I’m always on the hunt for a good brownie recipe (fudge-y, not cake-y). I like mine simple too. No frosting needed! Thanks for sharing and I’m keeping my fingers crossed for our guys (your brother and friend, particularly) tonight!!! I hope you love these brownies, Molly! Thank you!! Wow, what a great story. Congratulations to your brother.These brownies look fantastic. I’m going to make them today. Save a corner piece for me!! Can’t watch to watch Team USA tonight! Woo!! So glad you like these! Tieghan you are seriously a mind-reader. I was literally just searching for crinkly top brownies (the ones from my childhood as well!) yesterday on Pinterest lol but couldn’t find any that really matched what I wanted. These sound Perfect! If I halved the recipe and baked them in a 8×8 pan would that work out okay? I don’t need them to be extra thick, and 2 sticks of butter is a LOT for me to use in one recipe! These look divine! And congrats to your brother! I agree with another comment posted by a reader about doing a BTS with failed recipes. I’ve always wondered what people do with their failed recipe tests. Do you still hand them out to family and friends? Straight to the trash? Thanks! Thank you so much Leigh! And it totally depends.. like whether they taste good or not! In the oven right now thanks! Ah let me know how they turn out for you! Thanks Tracy! If I don’t have instant coffee, am I out of luck? I love your recipes! Thank you for being so delicious. It just so happened I turned the olympics on and the first thing I see is Big Air and it was Red’s turn. Not sure I would watch it if he was my brother, it’s a crazy sport! 😄 The cameras are so good! So glad you got to see him! Yes, it is such a crazy sport and so hard to watch! Just so glad he makes it down safe haha! I love these brownies! I agree that simple is best. 🙂 My mom also used to bake me and my sister brownies and I miss her food. These seem like a lovely dessert to have while watching the Olympics or a movie night. I hope Red and Kyle did well! Haha these brownies would be a nice dessert for when they get back. Maybe you can have a movie night with all of their favorite foods for when they get back. These look gold-medal worthy! Congrats again to your brother on his gold (and on his fifth place finish tonight). Congrats also to his friend/like-a brother Kyle Mack for his silver tonight. Nice that Kyle got his silver after his jacket finished first on your brother in Red’s first event! 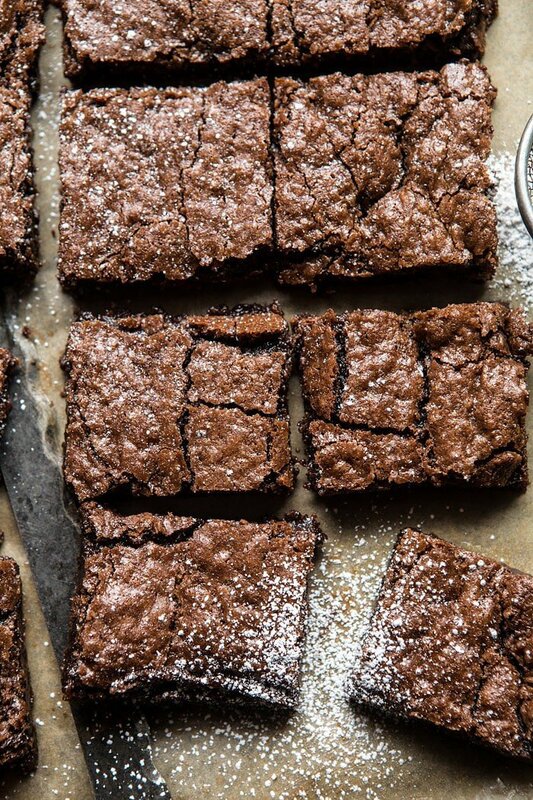 …and I can’t wait to try these brownies! Haha thank you so much Natalie! I am so glad you got to watch them and I am so proud of those two! You’ll have to try sometime a recipe that dissolves the sugar in butter on the stove. It makes for a perfect crinkly top!!! I have egg allergies so found this method to be awesome. 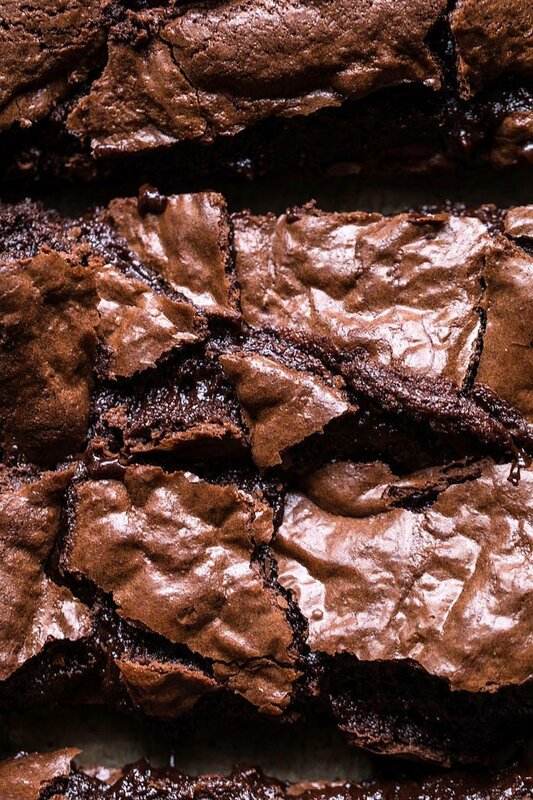 I made these brownies and the family all agreed……”best brownies ever”! Our new “go-to recipe”. The baking time ended up longer than suggested but I attribute that to using Jumbo eggs rather than large eggs and the oval baking pan size was somewhere between 9×9 and 9×12 and also baking at 9100ft elevation often takes longer. Thanks Tieghan for persevering with your many tries and generously sharing your success with us! I am so glad to hear that Mary! Thank you so much! Excellent recipe! Just baked and tried. The consistency turned out well, and was baked just enough to have a slight gooiness. I had to make a slight adjustment – didn’t have baking powder and after listening to a podcast on opting for unsaturated fats, I cut the butter down to 1 stick instead of 2. For these two reasons I was very surprised by how well the texture came out. If I could make any change, it would be to add a bit less sugar as the semi sweet chocolate and cocoa powder gave it some too. Overall I’d say this is a win and sticking as a go to recipe for from-scratch brownies. Thank you!!!! I am really glad you enjoyed these brownies! Thank you! Congratulations to Red on his GOLD!! 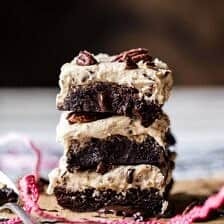 I think this is certainly a perfect celebratory recipe for him and I myself can’t wait to give it a go – maybe I will try it for my friends birthday, the celebratory brownie! YUM! Yes!! I hope you all love these Holly! Thank you! Awh that is amazing to hear! Thank you Barbara! Thank you Elizabeth! I really like to be sure! I hope you love these! Ah I hope you love them! Thank you Kate! What does the coffee do? Can the recipe be made without the coffee granules? What is 2 sticks of butter in cups? 2 sticks is equal to 1 cup! Let me know if you have any other questions! These were amazing and so easy to make! I loved eating them warm with some vanilla ice cream. My new go-to brownie recipe! So happy to hear that! Thanks Neha! The tops of my brownies didn’t look as crinkly as yours, I probably didn’t whisk the eggs enough. Nonetheless, these brownies were amazing!! I made them for a group of people and everybody was raving about them! I am really glad you enjoyed these Emily! Thank you! Are your recipes adjusted for high altitude? I am at 7300 ft. You must’ve higher than that. 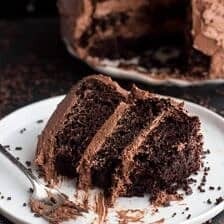 Absolutely delicious and easy to make! My mom, who doesn’t even like brownies, LOVED these. They are moist, dense, but also have a touch of that coffee flavor. Will definitely make again! Thank you so much Emma! I am so glad you liked these brownies! Made it, and my family loved it *esp after cooled in the fridge :)) Thanks for the recipe! Hi Amalia! I do not have the caloric information for these brownies, but I find online food calculators work great! So sorry about this. Please let me know if you have any other questions! I stumbled across this recipe, and will be making it either today or tomorrow. It sounds fantastic! Would I be able to bake this in an 8×8 in. pan? If so, for how long? Thank you! Would it taste the same (if not better 😉) if I replace the chocolate chips with chopped up baking chocolate instead? This looks really good and I am going to bake this later today. With boys out of school due to the nor’easter storm, this will be perfect. Thanks again. I have asked questions before but do not see an answer. What an I doing wrong? Are your baking recipes adjusted for altitude? Hi Cat! My recipes will work at a higher altitude, so no need to change it. I hope you enjoy these brownies! Hi! Would unsalted butter sticks work as a substitution for salted butter???? Would I need to add salt to the recipe if I do? I made the double-thick version in the 9×9 for company. It took about 1 hour and not the 30-35… but omg it was well worth the wait. We gobbled up warm with good quality vanilla ice cream and dare I say… hot fudge. You could have heard a pin drop in the dining room if it weren’t for the scraping of plates. A definite keeper! Merci! I am so glad you liked these Cyn! Thank you!! Hi Amalia! I have been considering adding it, but I like that my recipes focus on eating whole foods, not on the fat content or amount of calories. I hope you can understand! Hi do those freeze well? Made an 8×8 pan of these this morning and they are already half gone! Excellent brownie recipe. Haha I love that! Thank you Laura! I am so glad you liked these! Thanks Emma! I THINK YOU ARE REFERRING TWO HALF STICKS OF BUTTER. DO YOU MEAN I STICK OF BUTTER (8TBSP)? TWO STICKS SEEMS TOO MUCH BUTTER.. CAN YOU CLARIFY. THANKS? Do I have to add the coffee granules? First, thanks for practicing and getting the recipe just right. I’ve made these brownies twice now. And it won’t be the last! First time I baked them in the 9×13. Today I used my 9×9. Also, instead of adding the last 1/2 cup chips when mixing, I added 1/2 cup chopped walnuts the second time. I didn’t have instant coffee on hand either time, just some instant espresso, so I adjusted the amount added. These are excellent brownies. Thanks again. Hi Jan! I am so glad you enjoyed this recipe! Thank you so much! I saw this recipe while we were in Florida for the winter. Now that we are back in Boulder for the rest of the year I was wondering about whether or not your recipes are made for “altitude” cooking. Where you live is even higher than Boulder! Just curious…trying these today just as written…but need to go get more butter as I need to make two batches! Hi Kaye! This recipe should work great at your altitude! I hope you love these! HI, Tieghan! 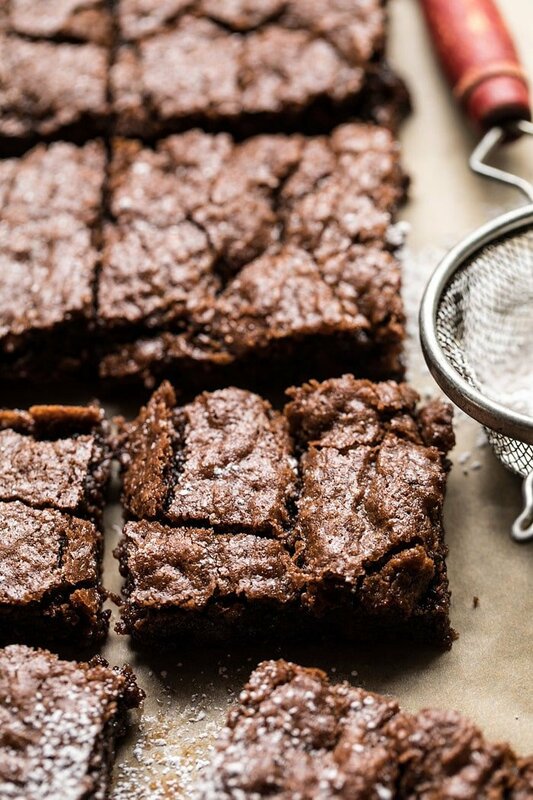 I just tried these brownies, and their consistency blew me away — delicious! Thank you! I wanted to ask if you have a favorite cocoa you like to use for deep, chocolatey things such as brownies. Again, thanks for all the delicious-ness you add to the world! Hi Lauren! I am so glad you loved this! I use Dutch process or 100% unsweetened Hersey’s cocoa. The brownies were just amazing, just melts in your mouth. I don’t generally have instant coffee, can strong brewed coffee be added as a substitute? Looking forward to making these, with or without the coffee! Really Hungry making design and pictures … Good job and congratulation for professional kitchen master! Made these today and they out fudgy and chocolatey just like I like them!! Definitely a keeper recipe! Thank you so much for sharing!! Thank you so much Sakina! I halved this recipe and baked in an 8×8 pan and they were DELICIOUS! I’ve cooked many meals from your site but this is my first baked good and I’m so glad I tried it! 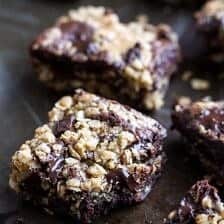 Super quick and easy to make and they were the perfect combo of chewy and fudgy. . I am so glad these turned out amazing for you Hilary! Thank you so much! These turned out way too gooey. I will probably not make them again, I baked for 28 minutes. Maybe I should’ve baked for longer. So sorry about that Teri! They may need a bit more time if you are closer to sea level! Please let me know if you have any questions! I hope they love it! Thank you Aliena! Haha that is so amazing! I am so glad you love these! Oh my gosh these are the best brownies! 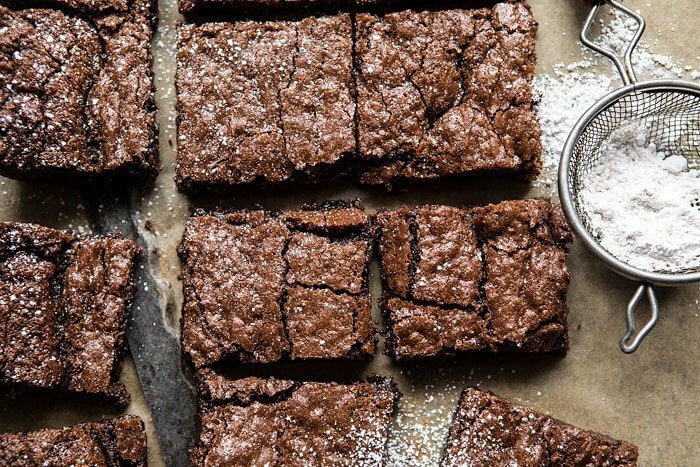 I have been searching for a brownie recipe that is better than a box for like a year and these win 100 times over! Thanks girl! Thank you Sarah! I am so glad you loved these brownies! Hi Ginie! Personally, I use an online calculator to convert, so I am not positive on the exact measurements. Please try this and let me know if you have any questions! This looks so good! You’re talkin about ‘cup’ measurement. I’m from Holland, we use grams. In your movie you use large and small bowls… Can you give me some clue how much grams a cup / half a cup of the different ingredients are? Thank you so much. Just dicovered your blog, and I love it. Hi Liesbeth! I am not to sure about the conversions, I just use google. I will link a website below with a bunch of cups to grams measurements! I hope this helps you! I am so happy to hear that! Thank you Ally! Very yummy recipe! Thank u for sharing! Perfect eaten hot and with a scoop of vanilla ice cream. Would reducing the melted chocolate make the recipe a bit less fudgy? Just made this recipe in time for Valentines Day. So yummy but FAST and EASY. Are these suppose to be very fudge? I keep baking and baking them (they have now been in and out of the oven for over an hour and they are still so liquidy that I can’t even pick one piece up without it all falling apart. I have followed this recipe to a T. I’m also at 1200 FT above sea level, if that makes any difference. HI! The elevation does make a difference. But did you change anything about the recipe? Any info on how you have made these would be helping in problem solving. Hope they turned out ok! Not sure what I did wrong, but these were super cakey..not at all like a brownie..
HI! can you give me some info on how you’ve made these? Any info would be helpful. So sorry for the trouble. Any substitution for instant coffee? Can regular coffee be used or can it be skipped? Hi, can I omit or substitute coffe granules? made these brownies today and they are AMAZING!!! These are great! It was just way too sweet for me. I’ll definitely reduce the amount of sugar next time. Great recipe, thanks! If mine turned out to be very-very crumbly, what could I have done wrong….? Could I substitute cinnamon for the coffee? And maybe a little cayenne pepper (I love spicy! )?